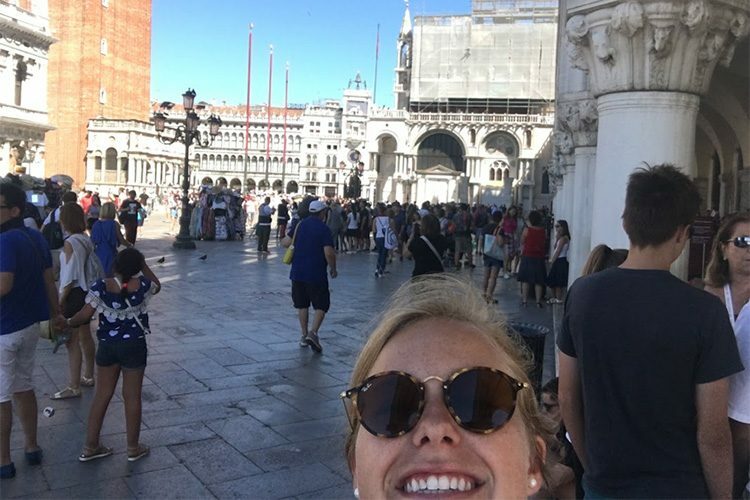 Editor’s note: In this series, Colgate students share stories about their summer experiences in offices, labs, and open spaces around the world. 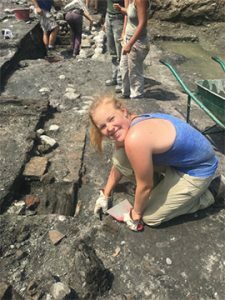 This summer, I spent time working with the Leno Project through the University of Verona on an archaeology site in a small town outside of Brescia, Italy. Each day the team would wake a little after sunrise and excavate until early evening. Working with other university students and professors, we slowly exposed and analyzed different layers of soil within a medieval home. We also spent time cleaning and cataloging finds from our excavations — shards of pottery, animal bones, and mosaic pieces. I was the only American on site and the only native English speaker. Therefore, I quickly had to learn how to rely on observation, tone, and gestures. Through the patience and kindness of my peers, I even picked up some Italian archaeology vocabulary. As a classical studies major, I gained a deeper appreciation of my field by understanding the lengths to which archaeologists must go in order to create an understanding of history. Such slow and sometimes painstaking work showed me how meticulous study of the different layers of soil could paint a picture of events that had transpired within the space. This environment certainly put me to the test as I grappled with the language barrier with my supervisors; however I learned more creative ways to express myself with my peers. I ultimately learned what a blessing it is to be able to communicate with a group of people efficiently; a simple smile can end up speaking volumes. I learned that attitude and perseverance through times of frustration are everything. I also learned how to be self-reliant as I traveled alone and built up my own confidence. Thank you Colgate for allowing me to pursue this lifelong dream.